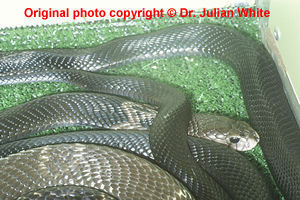 Large, heavy bodied snake with long cervical ribs capable of expansion to form a hood when threatened. Body is compressed dorsoventrally and subcylindrical posteriorly. Can grow to a maximum of about 1.7 metres. Head elliptical, depressed, slightly distinct from neck with short, rounded snout and large nostrils. Eyes moderate in size with round pupils. Dorsal scales are smooth and strongly oblique. Dorsal scale count for mainland China : 25 ( 23 - 27 ) - 21 ( 19 ) - 15. Adaptable to a wide range of terrain including grassland plains, jungle, open fields and even heavy populated regions. Terrestrial and mainly nocturnal, capable of spitting its venom in defense and particularly fond of water. Most active late afternoon and early evening. Tends to make an escape if disturbed. A very alert snake, seldom cornered, but if confronted will raise its forebody and spread its hood and strike readily if necessary. Young are more aggressive. Feeds mainly on rats, mice, frogs and toads, but will eat birds, snakes and eggs. 79.7 mg ( dry weight ), Gopalakrishnakone and Chou (1990) ( Ref : R000004 ). 150 to 200 mg ( dry weight ), Minton (1974) ( Ref : R000504 ). 184 mg ( dry weight ), Sawai (1976) ( Ref : R000769 ).